However it was quite the scaled back version… no delightful fully separate “Collector’s Room“. Instead it was a simple bar area with a row of whiskies on offer. Those we considered started at SGD80 a glass… we decided to try two and share… it was not an easy decision. Finish – What a fabulous finish! It was truly intense, dense, rich and almost on the edge of being too… everything! Remarkable, unforgettable and worth trying… once. Whereas I leaned towards a certain sentimentality – a whisky from the same year I was born! It was a rare 1980s Caol Ila bottled by Gordon & MacPhail. 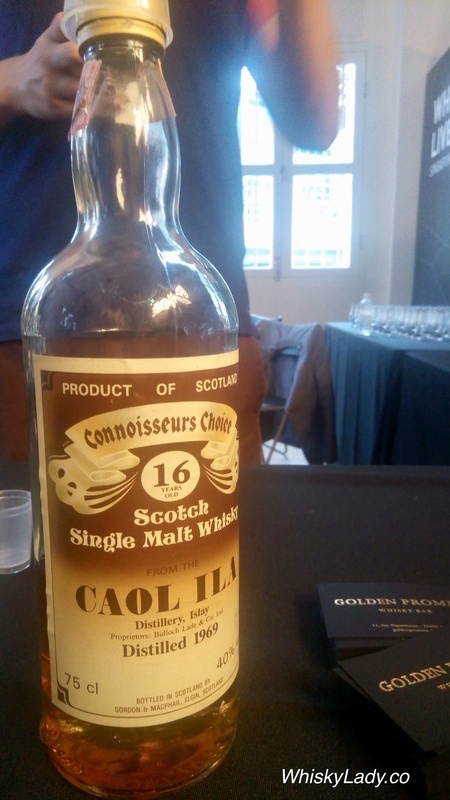 We remarked on how very different it was from the Caol Ila style of today. It was last seen on auction for approx £510.00. This entry was posted in Beyond Scotland, Islay, Japan, Scotland and tagged Caol Ila, Caol Ila 1969, Rare whisky, Whisky Live, Yamazaki, Yamazaki 12 year by Carissa Hickling. Bookmark the permalink.